nikkistyle™: Are They Too Young? Hot Topic! I was browsing through photos and stopped and starred at the one above: Is Suri Cruise wearing lipstick? Because I know the red smear ain't Kool-Aide. So check this out, and feel free to challenge me on what I am about to express: It is one thing for a young girl to "play dress up" around the house, but to incorporate getting her makeup done before she goes out in public -- is unsettling (no, disturbing.) The featured photo coupled with People magazine's latest cover story "Gone Too Far?" 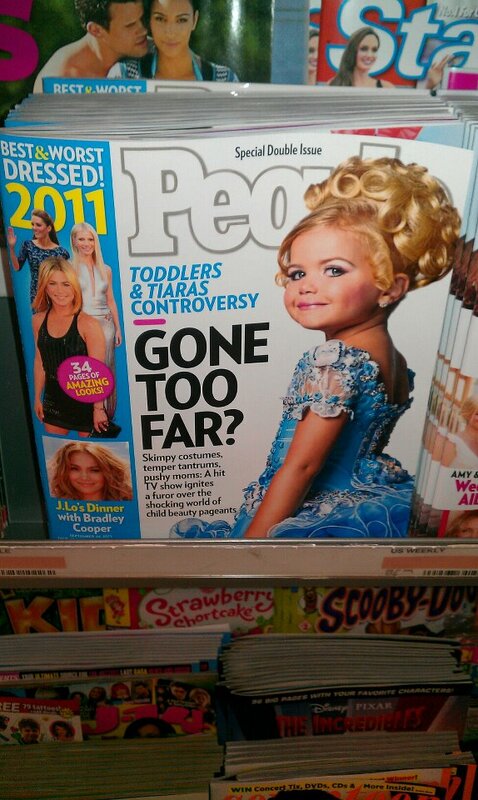 which discusses the Toddlers & Tiaras controversy makes me wanna punch something. Following are some thought-provoking 'research' questions as it relates to over beautifying young innocent girls: Are some parents going too far with beautification? Is it a form of negative exploitation? Are parents (and the general public) unintentionally defining beauty as having to cake-on makeup? What are the potential psychological implications of girls (younger than 11 years old) believing that beauty must correlate with wearing heavy amounts of makeup, red lipstick, gluing on false eyelashes, waxing body parts, and sewing-in hair extensions?